Mountains ring Seoul and one of the best to climb is Bugaksan, the peak behind the President's pad, Cheongwadae or Blue House. Several trailheads take hikers through reconstructed 15th-century gates and along Seoul's ancient fortress wall. From the top of the 342-m (112-ft.) ascent, you'll get a commanding view of the capital. You'll also get to follow in the footsteps of North Korean commandos who climbed the mountain some 40 years ago in an unsuccessful bid to assassinate the president; the Seoul Fortress, which had been closed for security purposes, was re-opened to visitors in 2006 (make a tour reservation a week in advance). Seoul's mountain trails can get clogged fairly quickly, so it's best to hit this hill during the week when the city's mountaineering hobbyists are at their offices. 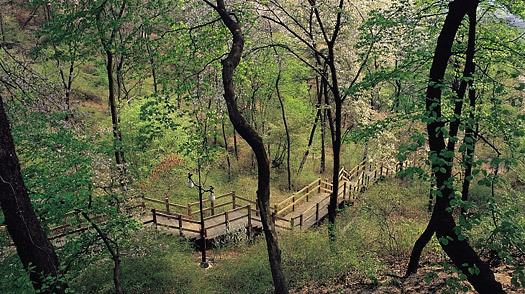 Ask a cab driver to take you to the Sukjeongmun gate, where you can access the best of the three trailheads. It's about a 10-minute drive from City Hall. Also, you'll need your passport to get on the trail, even if you don't look like a would-be assassin.